These days, you'll probably find Jamaica Kincaid musing on Paradise Lost in her garden. 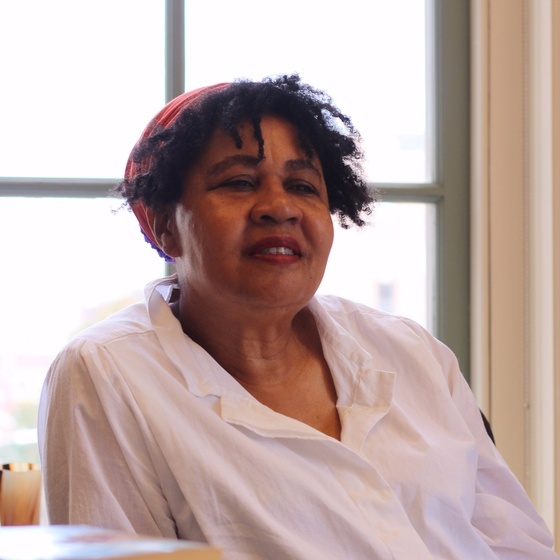 Jamaica Kincaid, a Professor of African and African American Studies in Residence, originally planned to pursue photography, but ended up becoming a writer instead. Her writing has taken her far: Kincaid, a long-time novelist who is known for blending autobiographical narratives with fictional characters, wrote for The New Yorker for 20 years and recently won the 2017 Dan David Prize in Literature, 33 years after she won her first literary award. Born in Antigua, she has recently been pondering the beauty of landscapes as she studies John Milton’s “Paradise Lost”, which she says reminds her that one of her main hobbies, gardening, is a great privilege. Editor’s note: This interview has been edited for length and clarity. FM: What does the word “home” mean to you? JK: Oh, it’s funny. When I’m here in America, I think home is Antigua. When I’m in Antigua, I think home is in Vermont. But I would choose Vermont over Antigua, for very peculiar inner reasons. Vermont is landlocked, and you can’t see the sea. You can see rivers and so on, and in Antigua, the only thing you can see is water all the time. I actually am terrified of water. I have a deep fear of water, so I would choose to live in a landlocked place where I can dream of water but never actually be threatened by it. FM: Is there any event or incident in your life that caused you to become afraid of water? JK: Probably something to do—as with so many things in my life—with my mother. You could read any book of mine and find this. I think that once, my mother and I were swimming, and she disappeared, and I couldn’t find her. I thought I wouldn’t see her again. Of course, she was just diving or something, and she reappeared. But the time between her disappearing and reappearing seemed an eternity. There are other times where she was in the same room with me but was a bit away from me, and I was never sure we would ever be back together again. But I think the water one that I just told you was particularly memorable. I think my fear of water must stem from that….I’m the sort of person who goes to the beach and never gets wet. I like looking at water, but I don’t like to be in it—unless it’s a bathtub. FM: Your original name is Elaine Potter Richardson. What’s in a name? In what ways do you feel like your changed name has affected your life? JK: I changed my name, as you can see online, because I started to write and I didn’t want my parents to know that I was doing something I would clearly fail at. No one from my background ever wrote, and I didn’t think I would succeed at it. But I didn’t care about failing. It never occurred to me that there was something called failure. I still don’t know what it is to fail—not that I’ve succeeded at everything, but what do you mean when you say, “failed”? You didn’t get into Harvard? Is that a failure? I suppose, if you were swimming and you were drowning, and you didn’t reach the shore, that would be a failure. But the rest, I don’t know. I don’t really have any expectations. I’m doing something, I don’t know how it will turn out. Maybe for some other people doing the same thing, it will turn out better for them than for me. But I wouldn’t consider myself a failure because I didn’t get as much as they did. I suppose I didn’t grow up in that way of expectations and failure and so on. I was brought up to do the best that I could do, in whatever I was doing. FM: Now, this is a big question, but between childhood and adulthood—what would you define to be the turning point of your life? JK: Oh, I don’t think I’ve ever become an adult. It’s very odd because I have two children and I raised them. I’m someone who believes that something significant happens to you by the time you’re seven. And then that’s the rest of your life. At seven years old, whatever it is that happens, you find ways of recapturing, reliving, refining, or reinventing it. It’s a pattern that you have. It’s something significant. Sometimes I think I know exactly what it is, but there are so many things. If being an adult means paying your bills and so on, I can do that. My essential nature is that I am still seven years old. At seven years of age, I loved reading the dictionary. I still love reading the dictionary! I have a collection of dictionaries of all kinds. My world was formed by reading “Paradise Lost at seven. I think I’m stuck at seven, and I’ve never become an adult. I try: I have mortgage, I have children, they’re going to college, I was married, I traveled—I do all sorts of adult things, but really, I’m seven. FM: What have you been working on this year? A New Year’s Resolution, a simple goal, a project, a piece of writing? JK: I never talk about what I’m writing. But I’ve been working on my garden a lot because, as every gardener knows, a garden is never set….My garden has at least 10,000 daffodils because I wanted to redeem Wordsworth. It’s a story about being forced to memorize his poem, “I Wandered Lonely as a Cloud.” So I decided that to pay homage to Wordsworth, I would plant at least 10,000 daffodils. That’s just on the lawn. Around and around, there are also sort of little homages to other things, sometimes historical. You would say a garden is a nice little thing, but I think of a garden as plant-hunting in Nepal. Sometimes, I have friends come over and we have a daffodil party, and we recite Wordsworth and drink champagne. It’s not Wordsworth’s fault that colonial education forced us to memorize a poem about a flower that we had never seen.